I'm wondering what the best material to root cuttings is. I see vermiculite and perlite, course sand and the like mentioned. We're starting a small nursery with sustainability as the main theme. I don't want to err on this front. Suggestions? That's what I use and it works great. Problem is, peat moss is not a very sustainable resource, and if you don't live close to where it's harvested, it leaves a pretty big transportation footprint. I live in Manitoba Canada, where a very large portion of North Americas peat moss comes from, (my friends in Louisiana bought some peat the other day, and discovered it came from Manitoba) so the footprint isn't so bad for me. Thanks for your fast response. I want to steer clear of peat moss because of the sustainability issues you mention. It sounds like perlite/vermiculite is OK since so little of it is mined globally (I've read that only 1% of the world's reserves are mined) and that the mining requires no chemicals etc - low environmental impact. Any suggestions about how to mix a good root cutting medium without peat? Is there general consensus that vermilculite/perlite is an environmentally responsible product to get involved with? We live close to the Canadian border. A Canadian supplier has offered to sell it to us and bring it to our nursery. I have mixed feelings about the sustainability of peat. People I know in MN/MI areas are telling me that the peat bogs (which are in the millions of acres category) are actually expanding. One said that a hundred years of harvest, at today's rate, would not diminish the supply. Personally, I am not that fond of peat, mainly due to the acidic factor. That said, it would probably be ideal for things like blueberries, roses, azaleas. Well that's good news. To be honest, my knowledge about it's sustainability is fairly old, so some more research would definitely be warranted on my part. As far as acidity, it's pretty easy to PH the mix with vinegar, borax, or whatever you prefer to use to bring the PH up or down. It's such a habit to PH things that I forget to even mention it. Thanks for filling in my gaps John! what are you trying to propagate? different mediums work better for different plants and different methods of propagation. 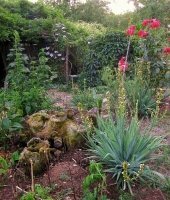 i use things like pumice, local screened lavarock, sand, screened charcoal, diatomatious earth, earthworm castings, even just water and plain soil. it all depends on the plant. It seems like some of the high performance ingredients are needed with the most troublesome propagation tasks (like Mr. Cumberdale said...). For an organic increment a sifted compost or verimcompost should be great. For grit, why not sand or crushed material. Isn't it just about organic functions + drainage functions + fungus control functions?! If you are actually after deconstructing and reconstructing your methods using an ethical design system, you might also want to consider embedded energy cost, and whether the organization you are giving your money too supports your values in multiple ways. The Pc design goal would be to have the energetic cost of construction the system be quickly paid off by the energetic gain of the system. Because plant propagation is a critical piece at the front end of system development, I might make more allowances. On the other hand, if propagation medium is going to be a ongoing operations cost for your system, why not substitute local material if you can. Taking out old trees.. Can I leave the roots in the ground?